Canadian city by Niagara Falls, with 520-ft.-high Skylon Tower views of the Horseshoe Falls section. Pennsylvania city with a Revolutionary War history on view at the Liberty Bell & Independence Hall. Colorado capital with museums dedicated to art, science & more, plus football & baseball stadiums. Georgia capital with Coca-Cola museum, Buckhead & Martin Luther King Jr National Historic Site. 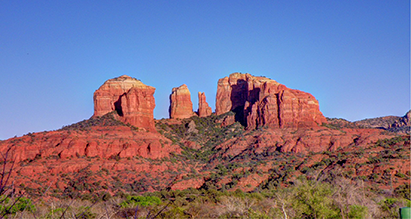 Arizona desert town known for red-rock buttes like Cathedral Rock, canyons & art galleries.